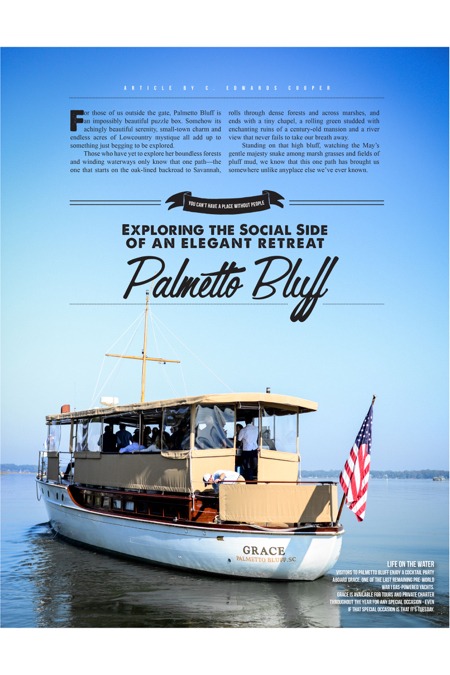 Hilton Head Magazines: CH2/CB2: You Can’t Have a Place Without People: Exploring the social side of the elegant retreat that is Palmetto Bluff. For those of us outside the gate, Palmetto Bluff is an impossibly beautiful puzzle box. 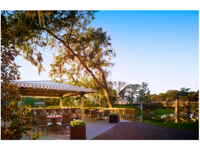 Somehow its achingly beautiful serenity, small-town charm and endless acres of Lowcountry mystique all add up to something just begging to be explored. Those who have yet to explore her boundless forests and winding waterways only know that one path—the one that starts on the oak-lined backroad to Savannah, rolls through dense forests and across marshes, and ends with a tiny chapel, a rolling green studded with enchanting ruins of a century-old mansion and a river view that never fails to take our breath away. Standing on that high bluff, watching the May’s gentle majesty snake among marsh grasses and fields of pluff mud, we know that this one path has brought us somewhere unlike anyplace else we’ve ever known. That last word is vital: place. 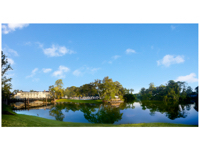 You’ll seldom hear the word “development” around the real estate office at Palmetto Bluff. You’ll never hear the word “project.” That’s because, above all things, Palmetto Bluff strives to be a place—a singular experience, crafted in field and stream, that you’ll find nowhere else. 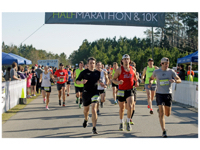 Among of the ways Palmetto Bluff aims to open its doors is through big events like its half marathon. If you’re among the runners on the starting line at 9 a.m. on March 12, you’ll get a chance to wind throughout the Bluff’s roads and pathways, discovering her at your own pace. While raising funds for the Palmetto Bluff Conservancy, this half marathon also gives visitors a perfect excuse to make their way inside the gate and find out what they’re hiding in there. And if half marathons aren’t your thing, there’s always the Summer Concert Series which brings out a slew of the area’s best musical acts for what we can say without hyperbole is one of the coolest musical experiences you’re going to find. Hearing outstanding live acts, with the pillars of Wilson mansion stretching toward the setting sun, framed by that majestic river view, is something everyone should experience once—or regularly, if we’re being honest. 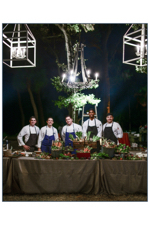 Then of course there’s the annual Music to Your Mouth celebration, which draws in chefs from all over the Southeast, plus a calendar wall-to-wall with events like historical presentations, guest lectures from leading scientists and conservationists, and more. If Wilson Landing is Palmetto Bluff’s downtown, designed as it is to breathe Charleston and Savannah-inspired streetscapes into the classic village layout, then Moreland Village is its rustic backcountry neighbor. 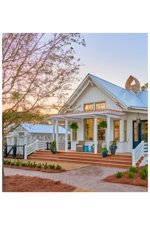 More defined by outdoor living, Moreland Village is a perfect extension of the bucolic charms so perfectly encapsulated by nearby Moreland Landing—the first structure ever built at Palmetto Bluff. If you haven’t had the opportunity, you owe it to yourself to spend a quiet moment at the tiny sliver of land set into the elbow of Cauleyoley’s cut as it bends the May River. Here, a hammock gently sways like the ebb and flow of the river before it, a tree house stretches away into a live oak’s meandering branches and a wide fire pit carries the promise of oyster roasts and friends coming together. “I love that as we developed Moreland Village, this spot stayed exactly the same as it was 14 year ago,” Hampson said, indicating with a sweep of her arm the indescribable beauty at Moreland Landing. Moreland Landing’s al fresco paradise informed every brick of Moreland Village Landing, where the outdoors is always welcomed in with an open door and windows thrown wide. With a planned opening in late March, construction was still a blur during a mid-February visit. But what was finished was remarkable. Two structures, connected by an open walkway, could only be described as towering. And yet they don’t seem to defy the small scale of Moreland Village. Their natural elements, walls of polished glass and footprint leading down to a tranquil pond rife with migratory birds and stocked with fish make them seem like a natural extension of the land, which is fitting since the Palmetto Bluff Conservancy will find a new home here, as will Outside Palmetto Bluff. Beside it, a picturesque cottage will host a monthly artist in residence, a program launched by Palmetto Bluff in partnership with Garden & Gun. 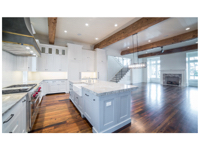 Architecturally, the house bows deeply to Lowcountry tradition, from its clapboard walls to its layout embracing a single room wrapped around a fireplace, with bedrooms meandering off. Where it defies tradition, as in its soaring vaulted ceilings and the white paint covering the fireplace, it does so intentionally and with reverence to its roots. Much the same can be said for the artists themselves. Rather than confining the program to traditional painters and sculptors, Palmetto Bluff has opened this cottage to such makers as Bill Oyster, who creates hand-made bamboo fishing rods. Planned for further visits are mixologists Bittermilk and James Beard award-winning chef Chris Hastings. Much like the half marathon, the festivals and the concerts, these programs form a critical part of what makes Palmetto Bluff special. They form what makes it a community. And for those of us outside the gates, that sense of community isn’t limited to geography. Because Palmetto Bluff is not, you’ll notice, a development. It’s not a project.